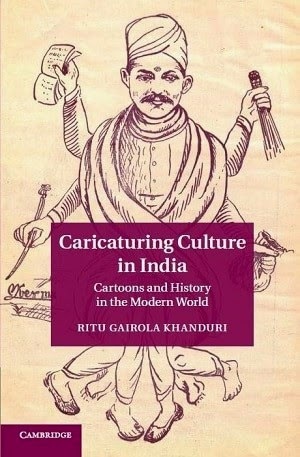 Today we are interviewing Ritu Gairola Khanduri, author of Caricaturing Culture in India. I am a cultural anthropologist and historian. I am fascinated by media and research on print media in its various forms, namely, political cartoons, advertisements and comic books, in the context of India and its diaspora. At the University of Texas-Arlington, where I am an associate professor and teach cultural anthropology, I offer courses on global cultures, theory, visual culture and South Asia. This coming fall I will be offering a new course on Gandhi. I was born and raised in India and have also spent some of my childhood in Sri Lanka. 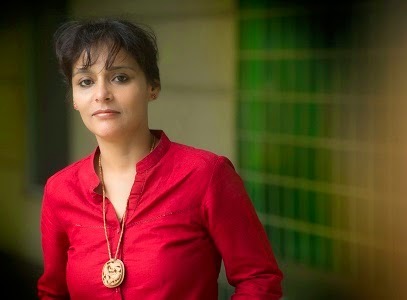 After obtaining my MA and MPhil in History at the Jawaharlal Nehru University, New Delhi, I came to the University of Texas at Austin to pursue my doctoral degree in cultural anthropology. Describe your book, Caricaturing Culture in India. Caricaturing Culture in India is a story of newspaper cartooning in India, beginning from its colonial years, when it was ruled by the British, until the present. My book shows that political cartoons not only reveal competing senses of humor but also serve as a turf for publicly debating how we represent communities and the limits of free speech or lack thereof in the contemporary world. Although India is the focus, the narrative also moves into the world of cartooning in Britain and the US. As the largest democracy in the world noted for its cultural diversity and secular politics, the social life of political cartoons in India is pertinent for understanding modern politics and it provides a fascinating look at the role of media in a global world. Who do you think would most appreciate Caricaturing Culture in India? While scholars and students of history, anthropology, media, political science and art history will find much that would speak directly to their discipline, this book would interest all those intrigued by the conversations about cartoons for thinking about free speech and the freedom of expression. The Charlie Hebdo incident in Paris earlier this year made headlines all over the world and triggered opinions on the ethics of caricatures and norms in journalism. Last week, a “Draw the Prophet” cartoon competition and exhibition in Garland, near Dallas, TX, resulted in a shooting and a flurry of exchanges about rights and wrongs, religion and speech. This discussion needs to move beyond pat answers. Both events tell a story about our present, that is how cartoons have become a litmus test for situating our politics. However, it is important to note that despite cartoons of the Prophet being the common point of controversy, the event in Texas does not mirror the politics of Charlie Hebdo. My book includes a chapter on the Danish cartoon controversy that occurred in 2005. Then too cartoons of the Prophet were at issue. Although one can’t predict events, by taking a close look at the past and the present, my book preempts questions around the growing significance of cartoons in cultural and political debates. With the recent events in Paris and Texas, I hope my book will also interest a broad audience and provide a useful reference for rethinking such murky politics. Do you think political cartoons have a similar influence universally? Or does the influence of the political cartoon vary culturally? Political cartoons exist within the context of histories and cultures. This means that political cartoons do not have a universal influence and neither do they resonate uniformly even in the same place and time. The public engaging cartoons is fragmented both before and after the cartoon. Ritu Gairola Khanduri, author of Caricaturing Culture in India. What inspired you to write about the history of political cartoons in India? Political cartoons are integral to India’s newspaper culture. One day while browsing the Times of India, I came across an anguished reader’s letter to editor complaining about the staff cartoonist, R. K. Laxman’s cartoon on a devastating earthquake. I couldn’t get that letter and cartoon off my mind. This sowed the seeds for a project on interpreting cartoons and to ponder the social life of cartoons. I was also adept at drawing caricatures and cartoons, so a part of my fascination with this subject also grew from a short-lived dream of becoming a cartoonist. What sources did you consult during your research? I consulted various archival materials such as newspapers, cartoon folios, magazines, news digests and colonial government files as well as contemporary reports on the media. Additionally, I had conversations with several cartoonists. Was it difficult to track down information about earlier political cartoons in India? Yes. The material I tracked was not consolidated in one archive and library—it had to be constructed through small steps that took me to various cities in three continents: New Delhi, Lucknow, Mumbai, London, Canterbury, and DC. A good chunk of this story of cartooning is a result of my conversations with senior cartoonists who began their career in the 1940s when India was at the cusp of independence from British rule. Those meetings too involved travel to different places in India. What are some of the more surprising things you uncovered while doing research on political cartoons in India? There were surprises at every stage of the research for my book. I was excited to learn of a rich culture of “comic papers” in late-nineteenth-early twentieth century colonial India—weekly newspapers and publications replete with cartoons in Urdu, Gujarati, Hindi and other languages. Mahatma Gandhi’s analysis of cartoons in the 1900s, when he was in South Africa, made me realize that they were a part of his discussion of non-violent politics. Closer to our own times, I was surprised to observe that we have few women cartoonists. Most importantly, it was eye-opening to learn of the numerous interpretive debates cartoons provoked. Has the role of the political cartoon changed as a function of changing technologies? Cartoons have crossed borders before social media and the Internet. Political cartoons from Indian newspapers such as the Anglo-Gujarati Hindi Punch, which began publication in 1854, were published in British news digest Review of Reviews. Closer to our own times, the New York Times frequently published cartoons by India’s leading practitioners, such as Shankar, Kutty, R. K. Laxman, Bireshwar and Samuel, among others. This border crossing meant that the cartoon’s reach exceeded the cartoonist’s intuitive public. With Twitter and Facebook, it is more pronounced today and is definitely in the cartoonist’s radar. I don’t think we should be too quick to surmise that this rapid circulation, retweeting and sharing political cartoons endangers it or curbs the cartoonist’s creativity. Instead, the cartoon’s social life reveals how power is evoked, subverted and asserted. Since cartoons position every one as critics, who can evaluate (unlike Art, which has designated critics performing that gatekeeping role), fret and celebrate, it opens up the space for deliberation and allows spilling over from social media to other public spaces, online to offline, and vice versa. It has consequences for everyone. We all get politicized. I am mindful that those who engage in social media are a fraction of the world. To give you an example of the cartoon’s generative capacity. A couple of years ago a professor from West Bengal, India, was incarcerated for a day on charges of defamation. His crime was that he shared a cartoon of the Chief Minister Mamata Bannerjee on Facebook. The professor did not make the cartoon. So this is an interesting case of the cartoon’s impact; its circulation, and not the cartoon, was perceived as a threat and punishable by those in power. When we realize such threats are felt in a democracy and necessitate penal action, it gives pause. Of course, examples of cartoons as threats or as demeaning communities occur in the US too and there are numerous complaints against “offensive" cartoons. Why is it important to understand the influence of political cartoons? What are some of the conclusions you arrived at through your research? Political cartoons, which tend to be published in newspapers and magazines, are ephemeral. This ephemerality, the prolific production cartoons in daily and serial publications, and the fact that this graphic satire is not celebrated as a “fine art,” tends to give the impression that cartoons are a trivial cultural production. They are not. Cartoonists are highly accomplished individuals, several I interviewed were art school graduates and saw their work as a form of political analysis. The diurnal, graphic and public form of cartoons brings immediacy to the politics around us. It works at a sensory level. All this makes cartoons significant. Several cartoonists shared their stories with me and navigated my attention as I traveled to archives and explored all sorts of print materials. As a cultural anthropologist, this engagement, “cartoon talk”—what readers make of the cartoons—and the social life of a cartoon, is at the core of my book. The paperback edition of my book was recently approved by Cambridge University Press and will be available soon. Readers are also welcome to correspond with me through my FB author page: https://www.facebook.com/ritugairolakhanduri.